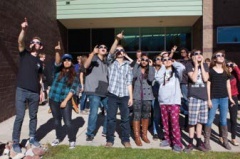 September 20, 2016 – Middle school students in Kennesburg will build their own solar system, look for sunspots and flares on the sun using a solar telescope and more, thanks to an outreach program offered through the University of Colorado Boulder. The CU-STARs – undergraduate and graduate astronomy students – will be heading to Weld Central Middle School on September 23 from 8:15-3:20 p.m. to lead hands-on science classes and informal demonstrations. Students from Cardinal Community Academy will be joining them. In addition, the public is invited to a free evening “star party” at Hoff Elementary School field, 7558 WCR 59 starting at 8 p.m., where telescopes will be set up to view planets and stars. Since 2011, the program has visited communities throughout Colorado, including Carbondale, Trinidad, Montrose, Delta and several schools in the Denver Public School system. CU-STARs (Science, Technology and Astronomy Recruits) recruit first-year students from diverse backgrounds to scientific careers. The program is open to all interested students, and does outreach to middle and high school classrooms around Colorado and organizes community building events.